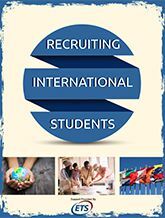 "Recruiting International Students" is Inside Higher Ed's new print-on-demand compilation of articles. The booklet features articles about trends, debates and strategies of a range of institutions. The compilation is free and you may download a copy here. Inside Higher Ed will present a free webinar on Thursday, August 27, at 2 p.m. Eastern, about the themes of the booklet. Please click here here to register or find out more. The publication of this booklet was made possible in part by the advertising support of ETS.